In exactly one week's time, we will be celebrating the most celebrated festival of the year. During this season of givings, many of us are busy shopping for the perfect gifts for our colleagues, friends and loved ones. Talking about shopping, either you do it online or offline, impulse buying is common scene if you are not religiously strict with your shopping budget, this is especially so as many of us have just gotten our year end bonus and/or early salary payment. A couple of days ago, one of the counter part at SingSaver.com.sg sent me an eBook titled "100 Ways To Save Money In Singapore". 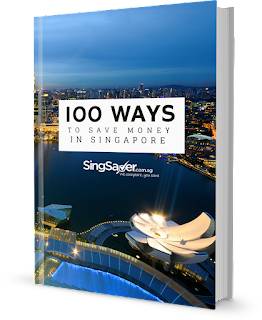 It is gorgeously compiled with practical tips on how to save money in various different sections like on retail, dining/nights out, groceries, household costs and travel. I especially like the tips in the Travel category as tips like "Know the Tourist Traps", "Most Museums have free entrance days" etc... never cross my mind when I am planning for my trips. If you are interested to download this eBook, feel free to download it here FREE!